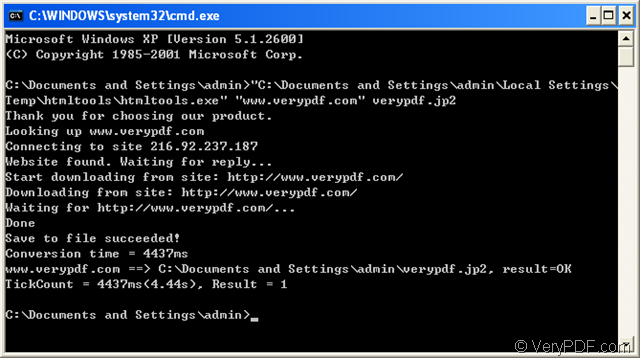 ← How to converter pdf to wmf with bigger dimension? Someone may want to use the webpage to do some graphic design,but everyone knows that the webpage can not be designed directly.So how to resolve this problem?You can convert html to image first,then you can design the image by many software such as the famous one—Photoshop.There are many types of image format,such as BMP,GIF,JPG,TIF,JP2,etc and which one you should choose is depend on your needs. In this article,you will see how to convert html to jp2 format with the software HTML Converter Command Line.Of course,you should know something about jp2 file format. JP2 is the file extension for the JPEG2000 image file format. You can think of it as the next generation of JPEG file format.JPEG is very common as a compressed format,but there are quality deteriorates in JPEG image.JPEG2000(jp2) files on the other hand can be compressed to much smaller file sizes with far less deterioration in image quality.So jp2 is an ideal format for users. HTML Converter Command Line can convert html to jp2 format.It allows you to convert web pages to PDF, PS (postscript), WMF, EMF,JP2 vector formats.It also allows you to create previews or thumbnails of web pages in a number of different formats, such as TIF, TIFF, JPG, JPEG, GIF, PNG, BMP, PCX, TGA, JP2 (JPEG2000), PNM, etc.You can download HTML Converter Command Line at the website http://www.verypdf.com/htmltools/htmltools.zip . Here are some steps for you to learn how to convert html to jp2 file format. Step1.Please click “start” – “run” and input “cmd” in “open” edit box,then click “OK” button to run cmd.exe.Please see Figure1 and Figure2. 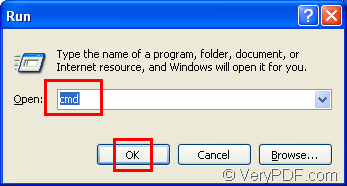 Step2.You can input command lines in cmd.exe dialog box.The commands include called program,source file and target file.Please see Figure3. NOTE:If there is no command about target file in command lines,the source file will be converted to pdf file by default. “C:\Documents and Settings\admin\Local Settings\Temp\htmltools\htmltools.exe" stands for the path of called program—htmltools.exe which is the executable file in HTML Converter Command Line. "www.verypdf.com" stands for the URL of webpage. 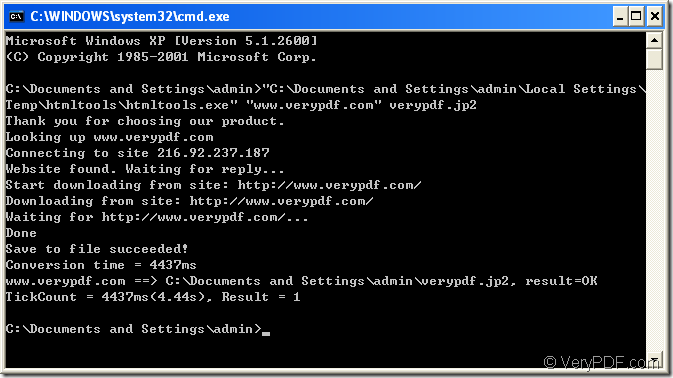 verypdf.jp2 stands for the name of target file,not including the directory. Step3.Then you can find the target file in the directory C:\Documents and Settings\admin after the conversion of html to jp2.You can see Figure4. 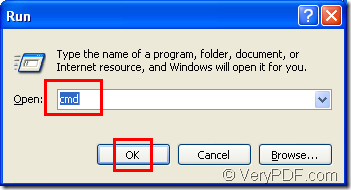 NOTE:If you specify the path of target file in command lines ,the file will be saved in the location you specified. 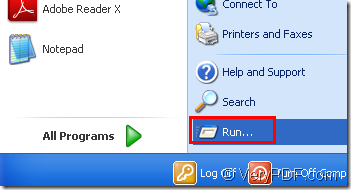 How to convert documents of HTML to JP2? This entry was posted in HTML Converter (htmltools) and tagged html to jp2. Bookmark the permalink.